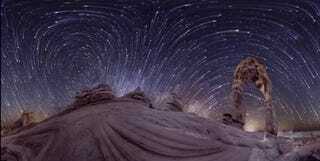 Astrophotographer Vincent Brady rigged up four – four – DSLR cameras, each equipped with a fish-eye lens, into a filming contraption of his own design so he could capture the footage required for this gobstopping 360° panoramic time-lapse of the night sky. "Beautiful" doesn't begin to describe it. ...the images show the stars rotating around the north star as well as the effect of the southern pole as well and a 360 degree panorama of the scene on Earth. Each camera is doing nonstop long exposures, typically about 1 minute consecutively for the life of the camera battery. Usually about 3 hours. I then made a script to stitch all the thousands of these panoramas into this time-lapse. I created my rig in January of 2013 while in my final semester at Lansing Community College before receiving an associates degree in photography. Given it was winter in Michigan, I didn't get to chase the notorious clear moonless night sky as much as I had hoped as the region has lots of cloud cover that time of year. Though I was ready on the rare night to go experiment. After graduating in May I had built up quite the urge to hit the road. My rig has taken me to firefly parties in Missouri, dark eerie nights at Devils Tower, through Logan Pass at Glacier National Park, up the mountains of British Columbia, and around the amazing arches and sandstone monuments in the Great American Southwest. This is a fantastic example of the importance of ingenuity in astrophotography. We've featured time-lapses from loads of astrophotographers, and every time I think they can't find a new angle on their craft, someone like Brady comes along and spices things up with a stunt like this, if you can even call it a stunt. The effect is so well-executed. Watching the star trails swirl through the sky, it's hard not to be reminded of Van Gogh's Starry Night. Then again, looking at Brady's bio pic from the about section of his website (that's him on the left), that may have been exactly what he intended.